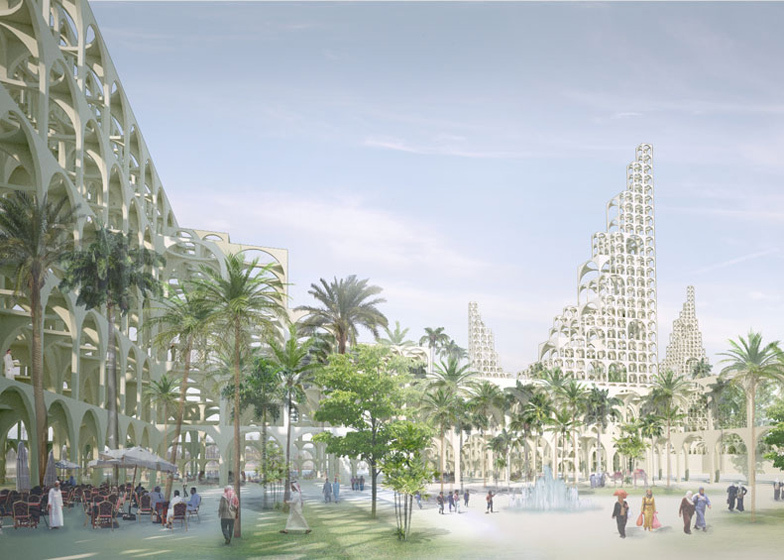 Japanese architect Sou Fujimoto has released images of a conceptual masterplan for an anonymous Middle Eastern city comprising tapering towers of stacked arches cooled by waterfalls (+ slideshow). 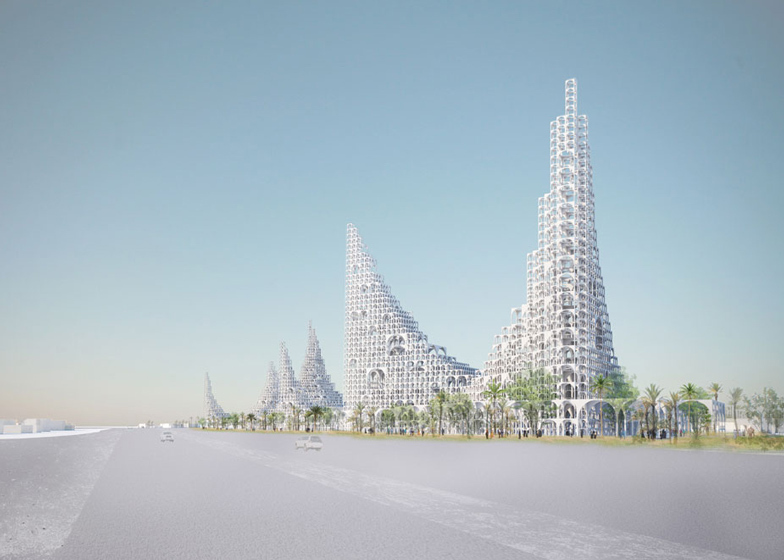 Fujimoto's two proposals include a complex at the end of a large avenue in the city made up of multiple towers with waterfalls flowing from top to bottom, and a low-level retail zone interspersed with towers that would be built along the shore. 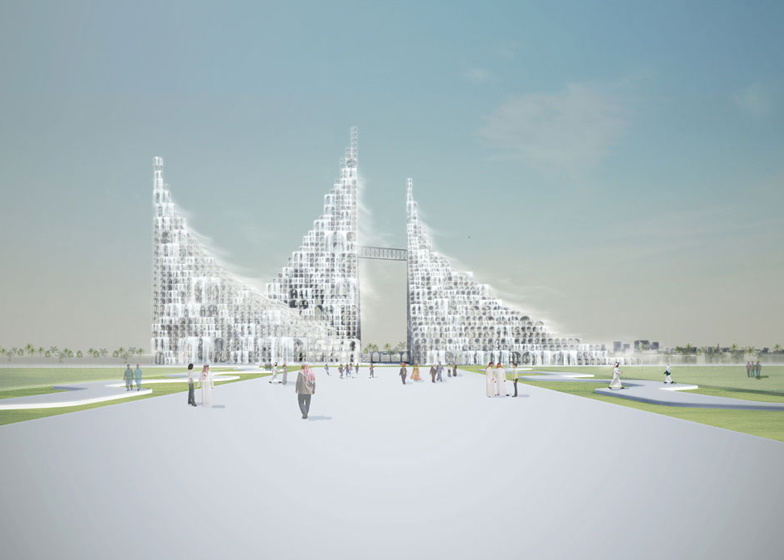 The Outlook Tower would create a distinctive presence on the skyline as seen from the adjacent waterfront, with several towers containing a series of waterfalls that descend through the structure to produce a cooling mist. "By incorporating multiple waterfalls, instead of one large [waterfall], different mountains of water are created feeding the avenue," said the architects. "There will be a wide range [of] waterfalls; smaller on the top to prevent any interference from the wind and larger towards the bottom to create evaporative cooling." The towers would become increasingly transparent towards the top as the density of the arches decreases. "From afar, the volumes are perceived as a gateway connecting the Corniche Sea with the mainland while having an overall mirage-like appearance," said the architects. 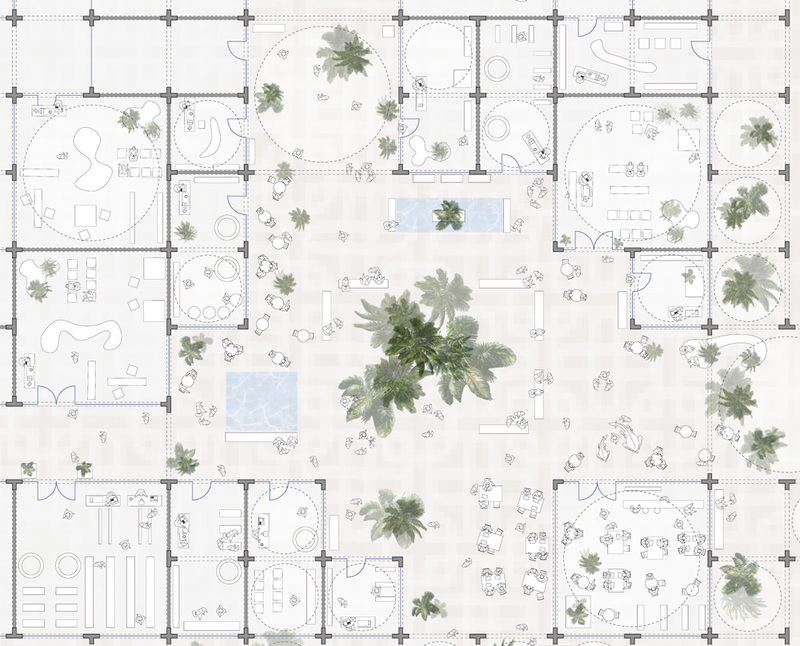 The second proposal, titled Souk Mirage / Particles of Light, would comprise structural arches stacked on top of each other to create an undulating topology incorporating retail, residential and office spaces, exhibition areas, a community centre, and a series of public courtyards and atriums surrounded by a green plaza. "This simple system organises the entire site, providing unity and coherence, as well as a unique and timeless architectural expression," the architects said of the modular construction. This project for the new retail zone seeks to participate fully within the larger master plan of a City. Located between Education City and Financial Center, the site plays a critical role in the future development of this city. In order to activate this portion of the site as well as to create a new landmark in the city, the project proposes not only low rise development, but a higher development, visible from far around. At an urban scale, the shape of the buildings is inspired by the harmonious silhouette of traditional Bedouin tents, anchoring the whole site in this city’s cultural heritage. 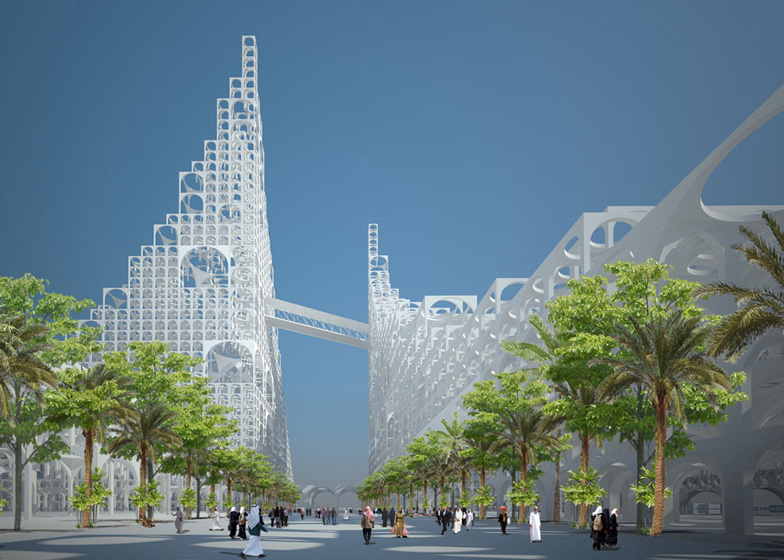 Reinterpreting the vibrant atmosphere and lively qualities of the traditional market, as well as the inherent beauty of vernacular Islamic architecture, the project is composed of a modular structural system of arches. Different sizes of arch modules (2.5, 5 and 10 meters) are stacked one on top of another depending on the program needs and the kind of space required. This simple system organises the entire site, providing unity and coherence, as well as a unique and timeless architectural expression. 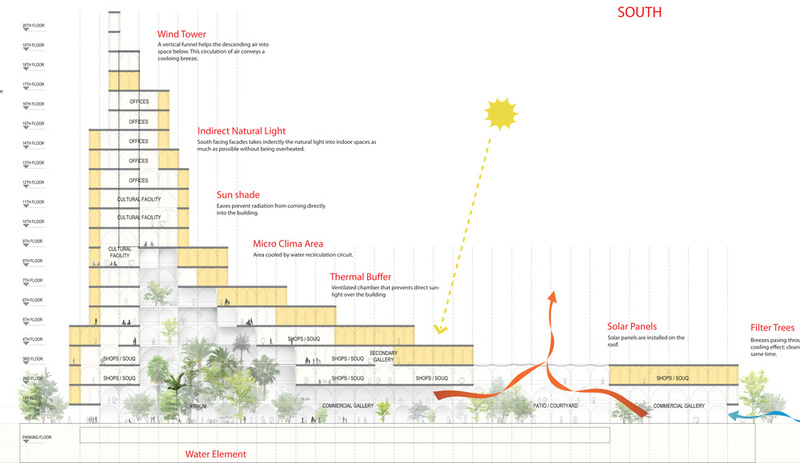 This project for an Outlook Tower and water plaza seeks to participate fully within the larger master plan of a City. Located at the beginning/end of the avenue, Education City and Financial Center in between, the site plays a critical role in the future development of this city. In order to activate this grand plan as well as to create a new landmark in the city, the project proposes multiple transparent towers, visible from far around and offering views on the most prominent historical and contemporary landmarks in this city. At an urban scale, the shapes of the buildings are inspired by the harmonious silhouette of traditional Bedouin tents, anchoring the whole site in this city’s cultural heritage. From afar, the volumes are perceived as a gateway connecting the Corniche Sea with the mainland while having an overall mirage-like appearance. Reinterpreting the inherent beauty of vernacular Islamic architecture, the project is composed of a modular structural system of arches. Different sizes of arch modules (3, 6 and 12 meters) are stacked one on top of another depending on the program needs and the kind of space required. This simple system organizes the entire site, providing unity and coherence, as well as a unique and timeless architectural expression. By incorporating multiple waterfalls, instead of one large, different mountains of water are created feeding the avenue. There will be a wide range waterfalls; smaller on the top to prevent any interference from the wind and larger towards the bottom to create evaporative cooling. By combining the transparency of the arches with the stepping waterfalls, a dynamic play with light and shadow is created, while appearing mirage-like.